Authored by Pitel on Mar 12 2018, 12:48 PM. The patch D5036 did calculate wrong whether the background color is light or not which resulted in always black background. The problem was that color reported by plasma is in range 0.0 -- 1.0 not 0 -- 255. 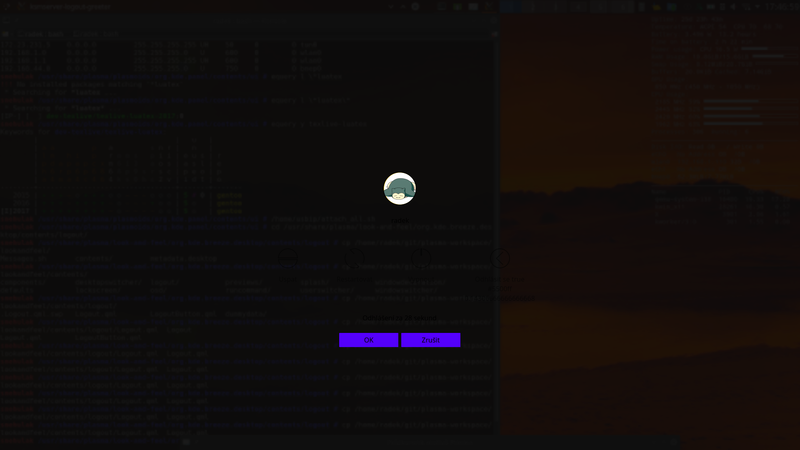 Now the background is black only when button background color is dark and otherwise it respects button background color. 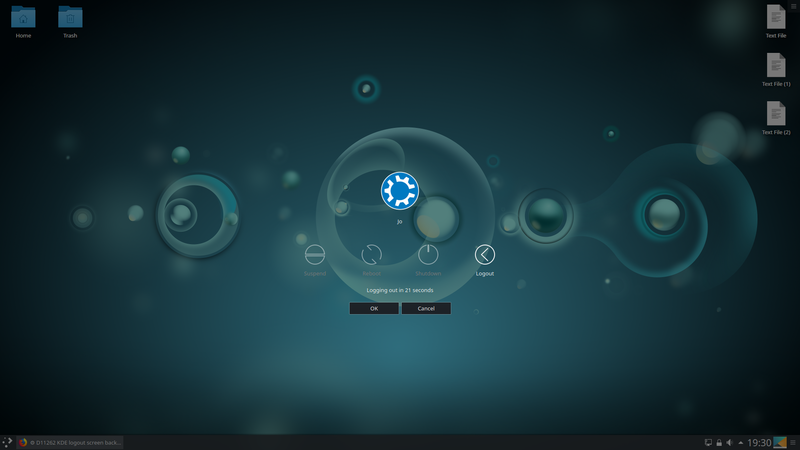 Pitel mentioned this in D7537: KDE logout screen - change black icons & texts to white/greyish. For Latte I am using a different way to determine Luminance..
@broulik do you know why this part is needed? What will it look like now? Screenshot? 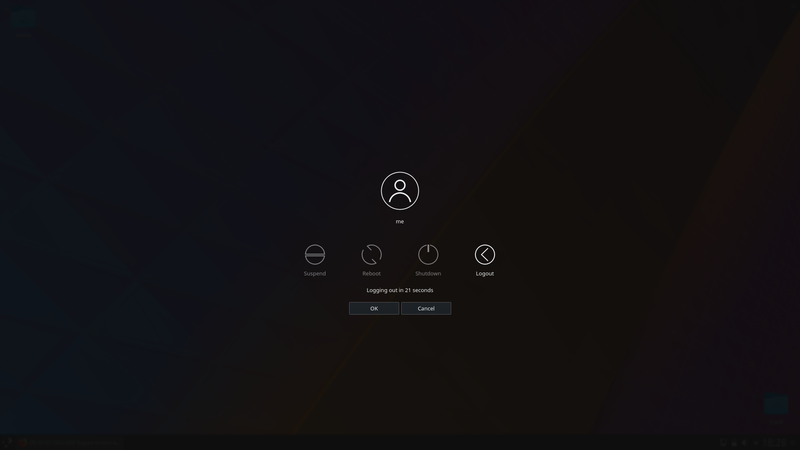 Would you be interested in producing similar patches for the Lock and Login screens, which suffer from the same issue? 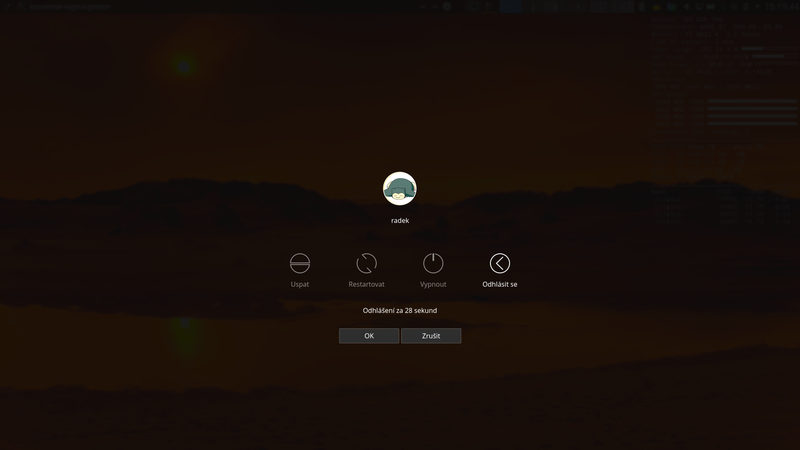 Those two seem to be a bit more complicated because the logout screen covers the desktop by some color overlay so we know how the background looks. But with login & lock screen there is only picture on the background and no color overlay. Adding color overlays on them seems unnatural and ugly. Other thing I tried is to add Glow effect. It solves readability problem but I do not like how it looks and documentation says it also needs OpenGL. Using background dependent color would require to calculate an "average color" of an image in qml and I do not see how to do that. 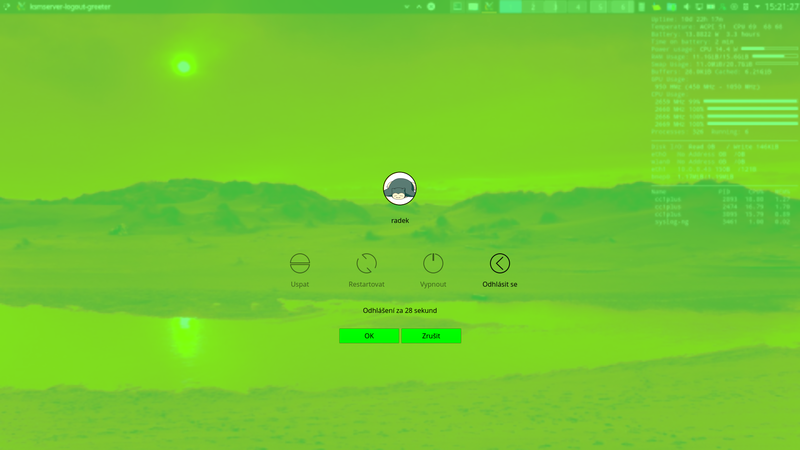 So the only solution I see right know is to add config options to select text color for lock & login screens. qGray() uses an integer approximation that is only correct for CRT monitors. yep, gray background definitely doesn't look good. can you try with the luminance formula and put a screenshot on how it looks? I finally got to do some testing and it is not looking good for luminance formula 0.2126*r + 0.7152*g + 0.0722*b.
Screenshot with background color #5500FF (blueish, button background on picture), you can see that black text is readable on it, but it has luminance only 0.14 so in overlay it is replaced by black. You can adjust the coefficients. Please check color (0, 0, 128), which is - according to the committed way - considered a light color. Maybe try something like (r+2*g+b) > 0.8. I guess I should have renamed it from isLightColor to something like isNotAlmostBlack... The point was to replace almost black colors with real black because it looks better with opacity. IMHO (0,0,128), which is deep blue, is far enough from black to not mess with it because font colors readable on deep blue background might not be readable on black one. 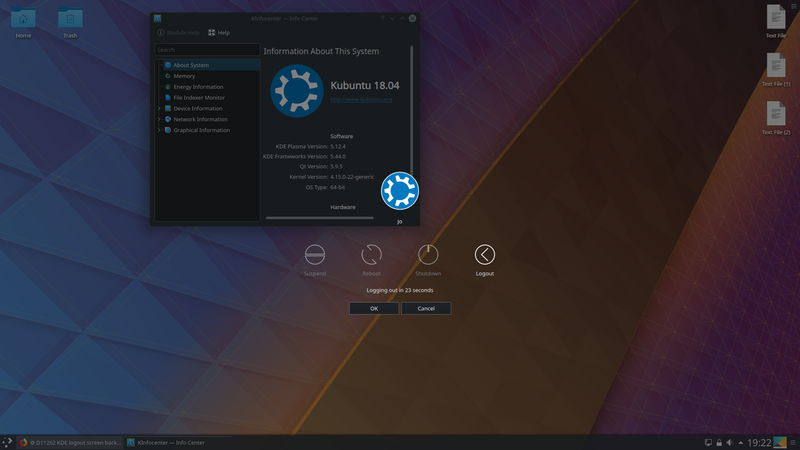 This seems to be a bugfix - Plasma/5.12 branch as well? It is meant as one. I am still kinda new here, so I am not exactly sure how to that (without confusing Phabricator). Cherry-pick the commit into the destination branch, merge into master and push both. Since it was already committed to the master branch, wouldn't just need to be cherry-picked into the Plasma/5.12 branch at this point? That's exactly what I wrote? I meant, we wouldn't need to subsequently merge it into master because in this case, it's already in master. Way too dark. A guy posted a 5.8 vs 5.12 on Neon's G+. Ray, this fix hasn't made it into a release yet; it was just committed this morning. So we wouldn't expect someone using 5.12.4 to benefit from the fix yet. Okay, Nate. It's good to know there's hope. Will this also fix the aliasing in the logout screen? @ragreen I am sorry to disappoint but this patch does not remove the (usually black) half-opaque overlay the G+ post refers to. 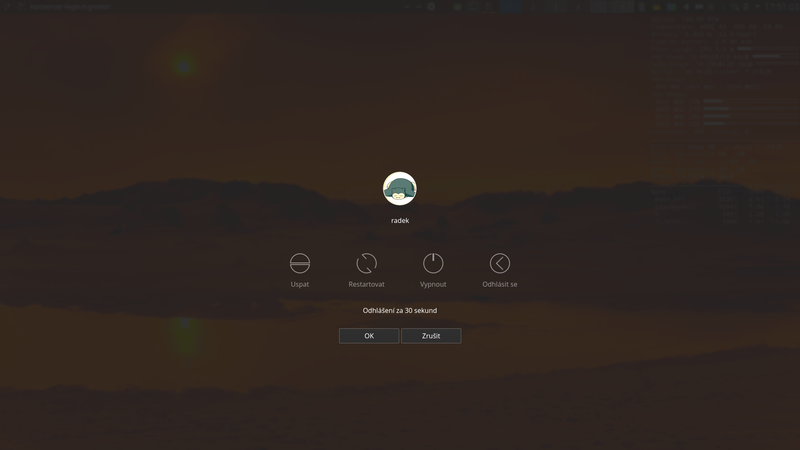 It only changes its color to button background color in the case that button background color is too far from black to make sure the text is readable. I guess the readability of text was the reason to introduce the overlay in the first place because only blurring the background (like 5.8 seems to do) is not enough in general. 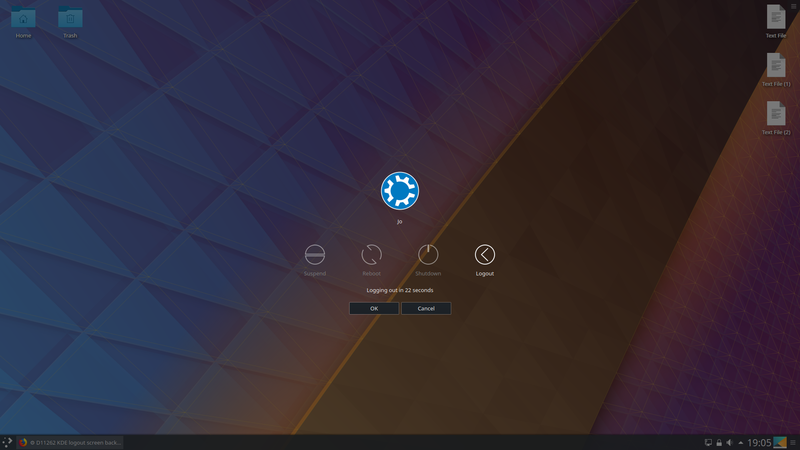 It also should be in Plasma/5.12 now. I guess the readability of text was the reason to introduce the overlay in the first place because only blurring the background (like 5.8 seems to do) is not enough in general. @Pitel I'm sorry to say this but they had nailed it in 5.8, then they ruined it in 5.12. @ragreen, this isn't the right place for that kind of discussion. Phabricator Differential is used for patch and code review, not commentary on larger design decisions. If you'd like to start a conversation about whether the current UX is a regression (and I would agree with you, FYI), it should be done in an applicable Bugzilla ticket or Phabricator Task, such as T7682. @ngraham You're right. Thanks for the heads-up. I did not mean that I want to ignore them, I just need them pointed out for me to start seeing them. Seems okay to me. It's not dark, it's fairly transparent and it doesn't have any artifacts. Can anyone confirm it with a screenshot?